They're already landing in Lorain, Ohio -- Puerto Rican families, with few possessions and bleak memories. "We started to see it last week," says Victor Leandry, director of El Centro, a nonprofit social services agency based in this faded industrial town on the shores of Lake Erie. "Just today, we have at least four or five new families. When I walk into the building at nine in the morning, we are seeing already a migration." This isn't the norm. In what's shaping up to be the second greatest exodus to the mainland since World War II, most Puerto Ricans fleeing the devastation of Hurricane Maria will end up in New York and Florida, where hundreds of thousands of islanders already live. But as Puerto Rico's economy has deteriorated in recent years -- the country's diaspora has ballooned to 5.4 million people, far exceeding the 3.4 million who live on the island itself -- many have migrated to other parts of the U.S. Some who leave the island as a result of Hurricane Maria will end up in lesser-known Puerto Rican communities in states like Ohio, Connecticut, Pennsylvania and Illinois. 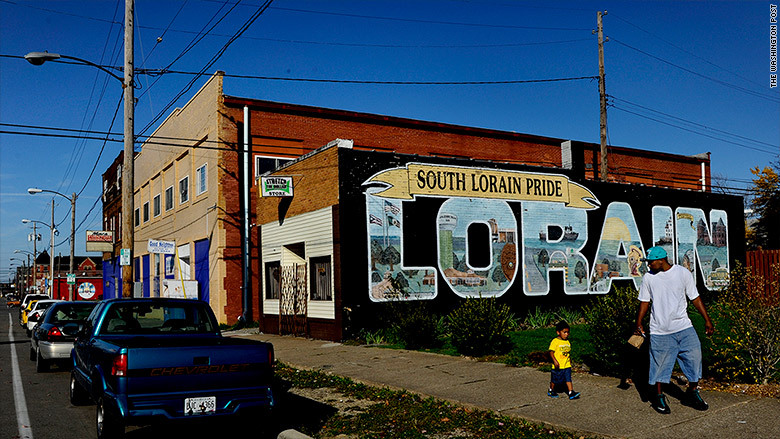 Many towns, like Lorain, could really use the newcomers. "As tragic as this [situation] is, it could be helpful to the Northeast Ohio economy," says Jose Feliciano, a lawyer who chairs the Hispanic Roundtable of Cleveland. "Ohio needs bodies for work." Feliciano points to a March 2017 Chicago Council on World Affairs study that found immigrants from places like Mexico and Central America have been one of the few sources of vitality across a broad swath of the Midwest. Puerto Ricans started migrating to Lorain and neighboring Cleveland 60 years ago, when manufacturers recruited a few hundred young men from the island to work in their factories and mills. The new arrivals prospered, buying homes and building streets full of restaurants and clubs, attracting thousands more Puerto Ricans. But the town was hit hard when U.S. Steel and Ford Motor started laying off workers and thousands of the town's residents moved away looking for jobs elsewhere. Today, about a quarter of Lorain's population of 63,000 is Puerto Rican. The community is now predominantly low-income. The largest employers are the hospital and the schools, as well as a smattering of restaurants and other small businesses. The area's unemployment rate has climbed over the past two years to 6.8% -- two and a half points above the national average. Still, many employers in Northeastern Ohio say they're desperate for employees. The problem is they can't find workers with the skills and education for the industries they are hiring for, like biomedical research and high-tech manufacturing. 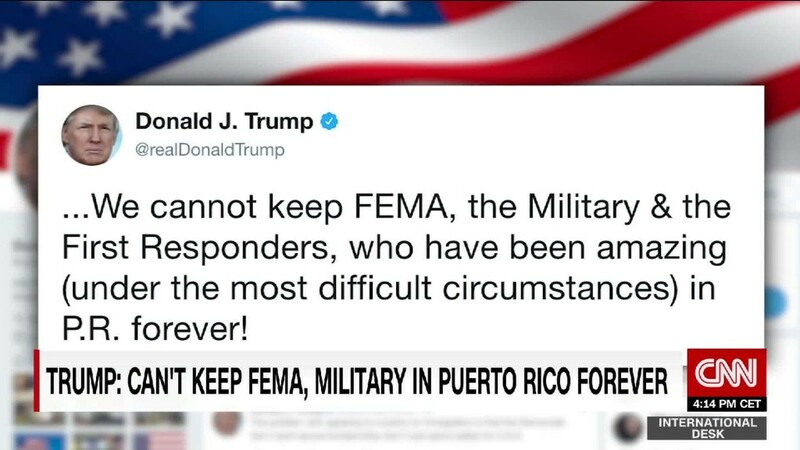 Puerto Rico could provide the answer to that problem. A robust university network and abundant scholarships have helped one out of four residents earn a bachelor's degree. That's less than the U.S. national average, but more than the island's weak economy can support. 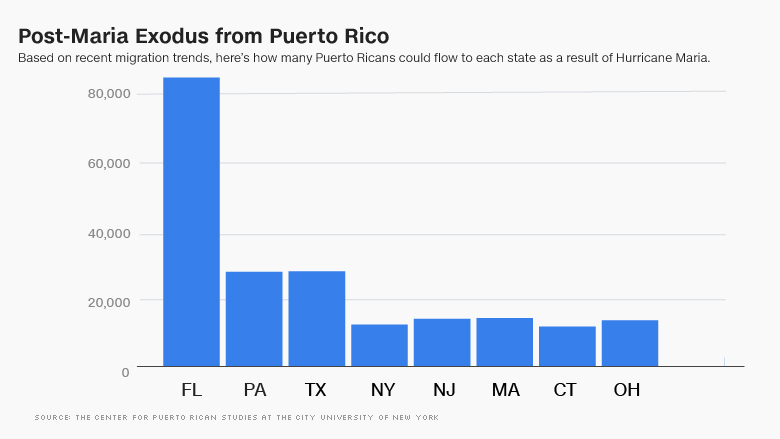 "You might even argue that there has been an excess of college educated people in Puerto Rico," says Jorge Duany, a professor of anthropology at Florida International University. For that reason, many Puerto Ricans have been recruited away from the island in recent years by school districts looking for bilingual teachers, hospitals looking for bilingual doctors and nurses, and aerospace companies looking for engineers. Texas, for example, has been the third most popular destination for Puerto Ricans over the past three years, after Florida and Pennsylvania. As the island's economy deteriorated, many have come to work in Houston's enormous medical center, as well as in education and in oil and gas. While the first waves of Puerto Rican migrants to places like New York were largely blue-collar or agricultural, "the majority of the Puerto Ricans in Texas are professionals" with college educations, says Javier Ferrer, president of Houston's annual Puerto Rican and Cuban festival, which grew from 7,000 attendees a decade ago to 25,000 last year. An influx of Puerto Rican workers could also be particularly helpful in Texas and Florida, which expect a shortage of construction and other types of workers as hurricane rebuilding begins in earnest, Ferrer notes. Puerto Rican-owned businesses in the U.S. are also expanding at a much faster than average rate, according to the Census Bureau. That doesn't mean Puerto Ricans fleeing Maria will provide an economic boost right away. While those escaping the economic crisis that hit the island over the past several years have been disproportionately younger and of working age, the current wave will include children, seniors and those who need medical care. At El Centro in Lorain, caseworkers have been helping the newly arrived families get access to government assistance like the Supplemental Nutrition Assistance Program, which is more commonly known as food stamps, as well as doctors for illnesses contracted in the flood waters. But over the longer term, Ohio state representative Daniel Ramos, a second-generation Puerto Rican who represents Lorain, says the newcomers will find jobs and add to the tax base. At a time when immigration from Mexico has leveled off, Puerto Rico could provide a vital source of new residents to lift the economy and refurbish the city's dilapidated homes. And this time, Ramos says, they'll have a more friendly reception than his grandfather, who came to the area in the 1950s, and was called unsavory names by the locals. For many Puerto Ricans, Northeast Ohio is now a place to call home. "People are showing up in Lorain and Cleveland, not because they have family there, but because they heard there were other Puerto Ricans there," Ramos says. "The schools are ready, because one out of four kids in the school is Puerto Rican anyway. It's not a foreign concept to have a bunch of people from the island there."